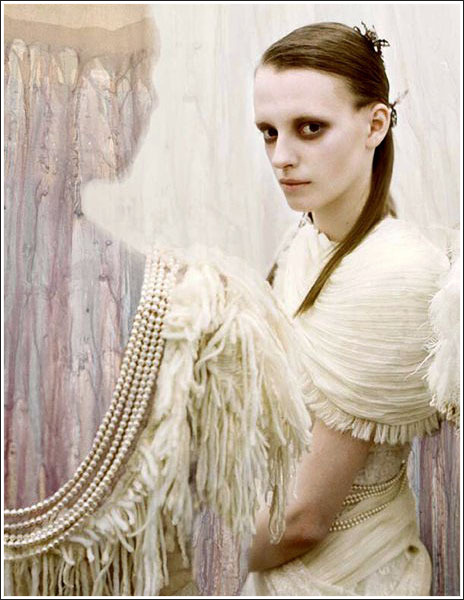 There has been a great deal of heated debate over the up-and-coming M.A.C/Rodarte Collaboration for Fall 2010 (due out September) which is causing controversy in the beauty blogging world. The Rodarte fashion collection has been inspired by the Mexican town of Juarez, which is notorious for its poverty, criminal activity and sweatshops which employ young women and teenagers. Many of these women have been raped and murdered and the police and government have refused to take action. What a PR fail! Whilst its good that MAC have took the criticism on board and are taking the matter seriously, it is still very disappointing that they are still profiting from others sadness. I believe ALL of their profits from the collection should be donated to charity, not just a percentage, similar to how mac supports charity with MAC Viva Glam. What are your opinions on this collection? I have a blog post too! I agree the PR was terrible for this.. it seemed like an after thought to give some of the proceeds to Juarez... and just bad taste all around. @Justine - i agree it was just an after thought! I think the collection will be a hit no matter what. I think its a good idea their donating part as well. I find it personally worse because like many, I consider MAC my favorite make-up brand because it's MORE than just make-up. The charities, causes, recycling, collections with artistic inspirations and collaborations... they always seemed to put thought into their actions and releases. Where was the thought here? Where was the awareness of issues? It actually directly goes against their stated philosophy in places. Thanks so much for the comment on my own post surrounding this controversy. It's great to see so many of us uniting on an issue that isn't going to disappear once MAC move onto promoting their next LE ocllection! Thanks for commenting on my post in regards to the MAC Rodarte Collection! I did a short post on this. I'm not a beauty blogger, but I have an interest in fashion, so I'm curious about Rodarte's involvement in this. When it comes to cultural insensitivity/awareness do they deserve a share of the blame? Do they get to be excused under the pretense that what they do is "art"? Fabulous post! Thanks so much for the comment. Definitely interested to see what comes of this. Wonderful post, Im so glad that mac have had a change of heart and there are other bloggers out there who are as angry as I am about the whole thing. I think this is a gross exageration and displacement of who is really at fault here...MAC has ALWAYS been sensitive to community issues and their Viva Glam Campaign continues to fund community issues GLOBALLY, not just in our United States. I think the real issue of poor choice lies with the sisters who fabricated the ideas for the insensitive color concepts and controversial names for this collection. Remember, it was MAC's VP that exercised responsibility in this matter and prevented this launch from hitting the counters! Even though MAC generally supports freedom of artists and designers it's ultimately Rodarte that made such inflammatory choices at a time that would hit raw nerves.